The Shih Tzu is a small dog – one of the Toy breeds. He is generally described as lively and outgoing and despite his size requires plenty of exercise. He makes a delightful companion and family dog but as with all breeds temperament will vary. His coat will become very long unless trimmed and will need regular grooming to avoid matts and tangles. 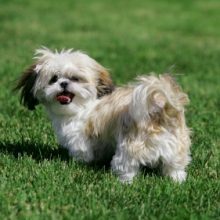 The Shih Tzu’s long coat, unless groomed and regularly trimmed, will impact on his quality of life. Care should be taken especially with the hair around the face and eyes. Brachycephalic ocular syndrome – due to the extremely short head shape and consequences on the shape and position of the eyes – causes several eye conditions that lead to chronic irritation and pain. 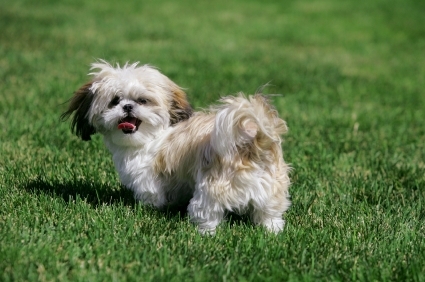 The Shih Tzu has short legs, a curly tail and immobile ears, all of which give him difficulties in signaling and communicating with other dogs.